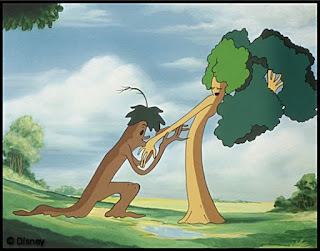 Disney's first color cartoon, the Silly Symphony Flowers and Trees. After a week off, Anthony and I are back Inside The Mouse Castle. This week, we start off with a couple of musical extravaganzas at the upcoming D23 Expo in Anaheim. Disney in Concert: A Silly Symphony Celebration will screen some of Walt Disney's great musical cartoons of the 1920s and '30s accompanied by a 32-piece orchestra. The massive fan gathering will also welcome Disney on Broadway's The Originals, celebrating Disney's great theatrical shows and starring Ashley Brown (Mary Poppins), James Monroe Iglehart (Aladdin) and Josh Strickland (Tarzan). Anthony and I also imagine a world where Nicolas Cage is in every Disney animation-to-live-action movie adaptation, but I digress. Disney will produce a live action film based on the "Night on Bald Mountain" sequence from Fantasia. Nicolas Cage as Chernabog, am I right? Disney has wiped Tron 3 off the grid. There will be no follow-up film to Tron: Legacy and that makes the users sad. Would you be willing to pay more to go to Disneyland during peak summer and holiday seasons? How about paying less to go in the off-season? A recent survey of Annual Passholders had social media buzzing about (gasp!) another ticket price increase. DCA guests can catch a preview of Marvel's Ant-Man, starring Paul Rudd and Michael Douglas, beginning June 19th in the...wait for it...Bug's Life Theater. Didn't see that coming, did you? A recent New York Times article has people questioning hiring practices at Walt Disney World. Two hundred fifty tech workers were laid off last October, but not before many of them trained their replacements: Indian immigrants working in the U.S. on temporary visas. Another WDW labor issue: can cast members in character costumes at the parks share their exploits on social media? Disney says no because it ruins the magic. We agree. Walt Disney Company CFO Jay Rasulo announced his resignation effective at the end of this month. He was passed over for the COO's position earlier this year in favor of Tom Staggs, who is now the heir apparent to replace Bob Iger when he retires. Publicly, Rasulo's departure from Disney will be amicable. We suspect he won't be unemployed long. "Almost" good enough to run the Walt Disney Company isn't a bad thing to have on your resume. We're very excited about the upcoming documentary, Walt Disney, scheduled to run on PBS September 14-15 as part of their American Experience series. Tangled, a new animated series based on the movie, is coming to the Disney Channel in 2017. I've already started obsessing on Rapunzel's hair length. It appears long in concept art for the series, but since it takes place after the movie, shouldn't it be short? Yes, I know hair grows. Don't start with me. The Walt Disney Animation Studios Short Films Collection will be out on Digital HD August 11th followed by a Blu-ray release on August 18th. The best of the bunch in this 12-film set are Paperman, Get a Horse!, Lorenzo and The Little Matchgirl. Get it. Disney's new line of high-tech, interactive toys looks intriguing. Playmation uses wearable tech, motion sensors and assorted action figures to create a toys-to-life experience that kids (and imaginative adults) can enjoy indoors or out. Go on adventures with the Avengers or (beginning next year) use the power of the Force in the Star Wars edition. They're even working on a Frozen version (of course they are).